Zaragoza IV is an apartment of great quality both in its materials and finishes (kitchen, windows, doors, etc) as in its furniture, all designed and oriented to seek the maximum comfort of our guests. The entrance hall of the apartment serves as a distribution area. On the left side there is a large kitchen, perfect for preparing great lunches or dinners, with space to cook comfortably and with a table in the center ideal for breakfast. If we walk across the hall, we enter a beautiful room, large, spacious and most of all, elegant. A perfect space for relaxation and rest, where no noise is to disturb our tranquility. In the left area of the house there are two bedrooms, one with a single bed of 0.90 x 1.90 and the other with a double bed of 1.50 x 2.00. Also, this second bedroom has a bathroom suite room. There is also a second independent bathroom. On the second floor there is to be found the third bedroom, with two beds of 0.90 x 2.00, bathroom en suite and the exit to the large private terrace. The private terrace is about 90 m2 in size and is all covered by artificial grass and furnished with furniture and garden plants. 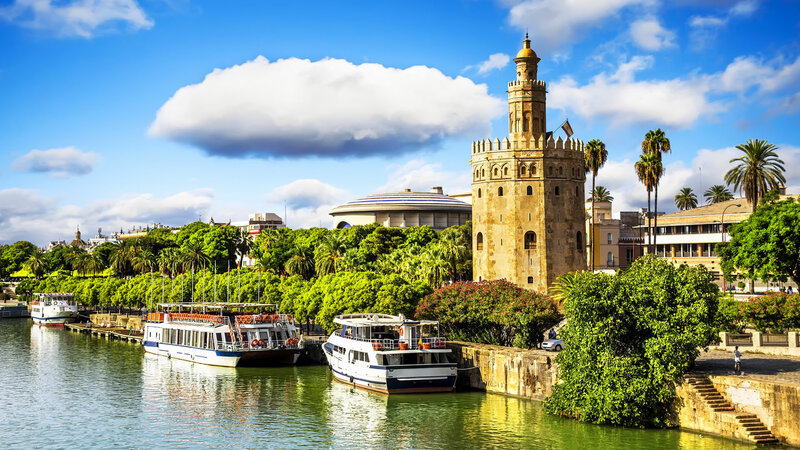 It is perfect to enjoy the sun and the climate of Seville to the fullest. The apartment is located at street Zaragoza number 62, perhaps the most expensive and exclusive area in the center of Seville. It is just in front of the Plaza Nueva (the most important in the city), a step away from the Cathedral, the Giralda, the Alcazar Palace, etc. In the surroundings of the apartment there are numerous shops, some supermarkets, small tapas and wine bars and magnificent restaurants where you can enjoy the best local cuisine.